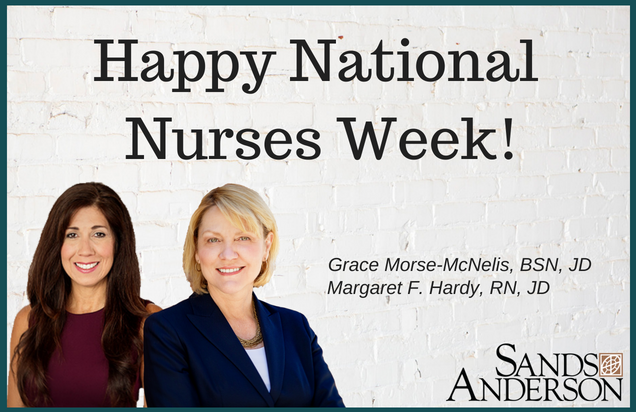 During National Nurses Week, Sands Anderson recognizes two of our attorneys who are registered nurses themselves! Margaret F. Hardy and Grace Morse-McNelis are proud to support nurses and healthcare professionals in their practice. Thank you for your work, Margaret and Grace, and thank you to all nurses who are a vital part of our healthcare systems. Margaret F. Hardy and Grace Morse-McNelis are both attorneys in Sands Anderson’s Healthcare Group.